Four companies have been invited to bid to supply new rollng for the DLR. UK: Invitations to negotiate for a contract to supply 43 trainsets for the Docklands Light Railway driverless light metro were issued to four prequalified bidders by Transport for London on November 17.
a consortium of Siemens, Stadler Bussnang and Stadler Rail Valencia. Interesting spread of potential bidders there. 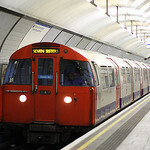 Very expensive trains based on TfL's £500m to £850m estimate! Very expensive trakns based on TfL's £500m to £850m estimate! IIRC the contract is a form of lease and maintain deal over a long period of time hence the potential contract value. TfL haven't actually got enough money in the budget to buy these as capital assets. Pretty sure that was in a recent paper or business plan or some such document. The lastest Programmes and Investment Cttee papers, for 11 December 2018 meeting, include a paper for the new DLR trains. See page 193 of the papers (page 199 of the pdf). Base order is 43 new trains (33 replace older B90/92 trains and 10 for growth) with options for another 34. Design would be three cars long but walk through as per XR and S Stock designs. There is a network diagram showing possible future service levels if the full fleet was ordered. There are some pretty impressive frequencies shown - 22½ tph on the Stratford International branch for example. What isn't shown are the possible new stations or extension to Thamesmead. Also includes Depot works I believe that will push the price up.